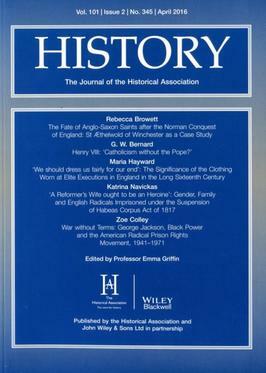 History is a peer-reviewed academic journal published quarterly by Wiley-Blackwell on behalf of the Historical Association. It was established in 1916 and publishes original articles, book reviews, and archive pieces in all areas of historical scholarship. The journal is abstracted and indexed by Scopus. In 2005, Marek Chodakiewicz published a monograph, The Massacre in Jedwabne, July 10, 1941: Before, During, and After. Chodakiewicz's work was favourably reviewed by Peter Stachura in History, but Antony Polonsky and Joanna Michlic then wrote a letter critical of the review, which History published. ^ "Content overview". Scopus. Elsevier. Retrieved 2015-08-31. This page was last edited on 12 November 2018, at 17:24 (UTC).